Richard Pietro and James Steenberg discuss one group’s open data application with them at Geothink’s 2016 Summer Institute. 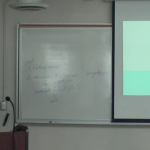 The 2016 Geothink Summer Institute kicked off on May 9 with introductions from Geothink Head Renee Sieber, associate professor in McGill University’s Department of Geography and School of Environment, and Pamela Robinson, associate professor in Ryerson University’s School of Urban and Regional Planning. By that afternoon, the 35 students attending had gotten their hands dirty conceptualizing applications for real open data. 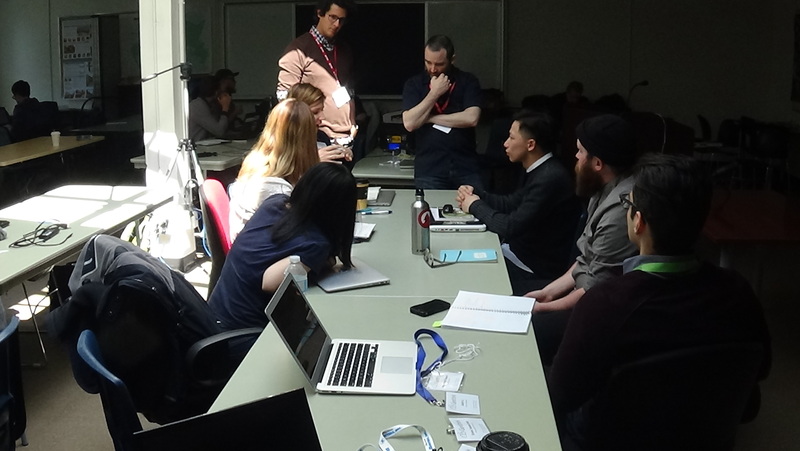 On day one, students learned about open data during an Open Data Iron Chef event with Toronto-based open data expert, Richard Pietro, who affectionately calls himself an open government and open data fanboy. He’s known for twice riding his motorcycle across Canada to raise awareness of open data, his film Open, and the company he founded OGT Productions. All of this work has led him to a unique view of open data and open government. 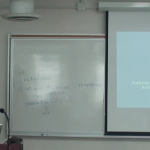 After Pietro’s introduction to open data, James Steenberg, a postdoctoral researcher at Ryerson University with Robinson, walked students through the different file types open data is often released in, what an actual data set might look like, and how to go about working with such data. The majority of the day was then given over to students actually finding data they wished to work with (Pietro gave a wide variety of examples during his presentation), a close examination of their chosen datasets, and determining novel uses for which the data could be used to improve city services or better engage citizens. At the end of the day, students presented their proposals that included an analysis of gaps in open data (in availability and quality) and what data was needed to be able to create an open data solution to a chosen real-world problem. The first student group conceptualized an application that would help facilitate urban resilience in the face of natural hazards. 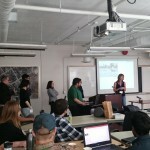 The second student group conceptualized an application to help predict burst water pipes. 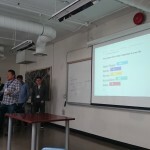 The third student group conceptualized an application to help in apartment searches. The fourth student group conceptualized an application that would help people tell when they’re in range of a survellience camera. The fifth student group conceptualized a project to help municipal decision-makers better understand the changing short-term rental market. 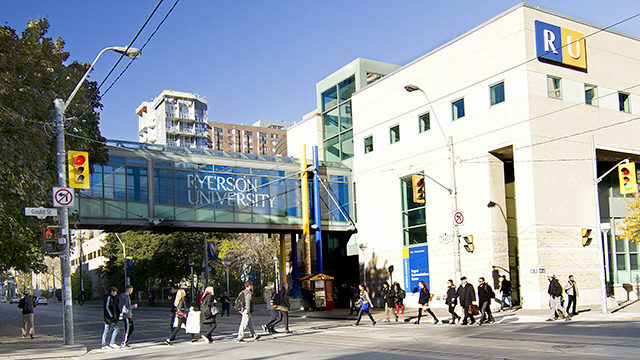 For one student group, this meant taking a closer look at data pertaining to water main breaks within the City of Toronto. In particular, they hoped to determine if any spatial pattern existed with water main breaks in comparison to aspects of the built or natural environments that might influence this phenomenon. The group felt such data could be used to help predict future break sites and facilitate repair before a rupture occurs. Experiences with this type of work within the group varied widely. “I don’t have a lot of background in some of this mapping stuff, so I come at it from a very different perspective,” Shelley Cook, from the University of British Columbia, Okanagan, said. Her group-mate, in contrast, felt quite comfortable with the project the group had chosen. Stay tuned for more iTunes podcasts from the Summer Institute here, check back on Geothink for synopses of days two and three, and, of course, watch more of our video clips (which we’ll be uploading in coming days) here. If you have thoughts or questions about this article or video, get in touch with Drew Bush, Geothink’s digital journalist, at drew.bush@mail.mcgill.ca. 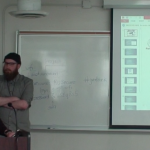 This entry was posted in Geothink Videos and tagged 2016 summer institute, application, Geothink, geothink students, James Steenberg, open data, open data iron chef, Richard Pietro, Ryerson University, students on May 18, 2016 by Drew Bush.